The first step towards better hearing is often the hardest. For this reason, our hearing evaluations are designed to be efficient, informative, interesting, and completely free of charge. We begin every evaluation with a review of your medical history, your symptoms and concerns, and a thorough physical examination of your ears. 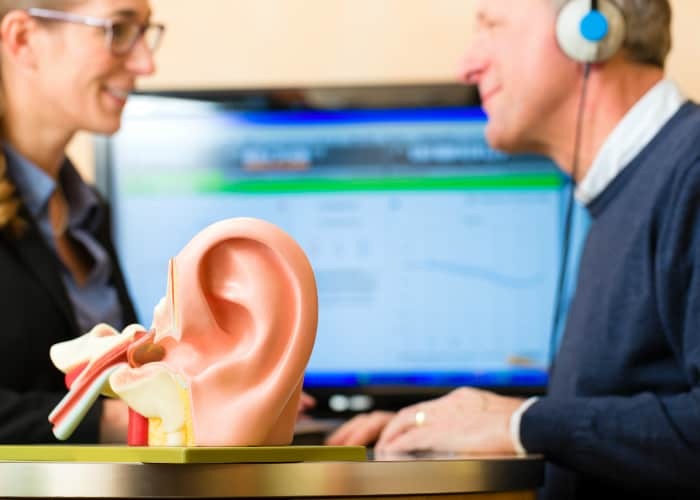 We use a state-of-the-art video camera to peer into your ear canal, displaying the image on a screen, so both you and your spouse can see if any wax build-up has been the cause of hearing issues. You’ll then be instructed to put on a pair of headphones and enter a sound booth for a complete battery of hearing tests. We use the latest technology that enables patients to evaluate their true ability to hear sounds by simulating real-life situations. Sometimes we will test across different tones and frequencies as well as utilize speech sounds in the presence of background noise. The full evaluation takes less than an hour, and at the end of it Peter will review the results of your hearing tests. He will discuss the best options for your unique hearing capacity and lifestyle, making sure to keep your budget and other priorities in mind. At Hearing Aid Specialists of the Central Coast, you can rest easy knowing that you will never feel pressured to choose any hearing solution that you’re not comfortable with. Our mission is to simply help you understand your current hearing ability and, if necessary, the choices available to help you on the way toward better hearing. Contact us today to schedule your free hearing evaluation.